Although this time, it was because he got stuck in the stairwell. This month is the 40th anniversary of the break-in at the Watergate Office Complex that ultimately led to the resignation of Richard Nixon. On June 11, the Washington Post sponsored an event that brought together a number of people who were involved in the events of that time, ranging from former White House Counsel John Dean and co-felon Egil Krogh to Bob Woodward, Carl Bernstein, and Ben Bradlee, former editor of the Washington Post. The event was held at the Watergate itself. It was a little surreal to see John Dean on a panel with one of the special prosecutors, among others, but he seemed to be having a grand time. It is true that many years have passed, and Dean has done a pretty good job rehabilitating himself, but still. Anyway, Dean, who writes a column for Justia.com, wrote a few days later about the event and his feelings on visiting the Watergate, which it turns out he had never visited before. When he had some time to kill, he went down to the sixth-floor stairwell, which was where the burglars had entered. He was curious, he said, why they had turned off their walkie-talkies and other devices and so did not know police had been called. Walking down the "cavernous stairs," he said, he realized that any sound in the stairwell echoes all over the place, so that he understood why the burglars had turned off the devices. Shortly thereafter, he also understood why they had put tape over the door latch: the stairwell doors lock behind you. To my surprise, the door was locked. So were the corresponding doors on the 5th floor, 7th floor, 8th floor, and 9th floor—and as I made my way back up I had an awful thought. 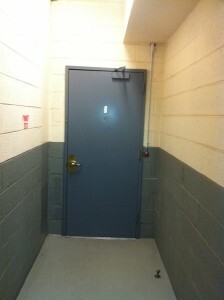 I experienced a flash of panic, and thought to myself, “I’m locked in the stairwell of the Watergate office complex. The Watergate conspiracy nutcases who have tried to connect me to the bungled break-in forty years ago are going to have a field day if I have to use my cell phone to get out of here.” But fortunately, the door on the 11th floor, through which I’d entered, was still ajar. Thus, I returned from my excursion with my pictures, and unnoticed. My excursion had proven valuable, as I now have an even better understanding of the foolish risk the burglars had taken by breaking into the DNC from that stairwell, which amplifies even the slightest noise, something the other visitors had missed. I can only wish that Dean had actually been forced to use his cell phone to escape, but I'd at least like to thank him for actually publishing this anecdote. Maybe one day the Watergate will no longer haunt John Dean, but so far that day has not yet come.